I am aware that there are in fact twelve feet in the picture above and even worse there are actually more than ten feet mentioned in this post, I never have been able to stick to a budget! I have been asked alot recently after introducing the Teflon foot in another tutorial, about sewing machine feet. There are lots of different kinds of presser feet depending on what you need to do and which machine you have. I thought today I would just run you through my ten… sorry twelve most used machine feet. I have three machines, a Janome 525s a Babylock 1600 and a mint green John Lewis mini and I am lucky enough that they all take standard low shank snap on feet. I have used contrasting threads to make it easier for you to see what each foot is capable of. Zig Zag foot The zigzag is the most versatile of all the feet that come with your machine. This is the foot that you cannot live without. With the ability to stitch almost any stitch through the oval opening, you would be lost without this little one. Zipper footFor sewing zips into anything a zipper foot is essential. Depending on your machine, your foot or your needle will shift from side to side to be able to get up close to the zip coil without the foot veering off the edge of the zip and without damaging the coil, so that you can attach your zips with neat straight stitches. Concealed zip foot You don’t need a concealed zip foot to insert a concealed zip but it is jolly useful if you do. The foot helps to roll the coil of the zip away whilst you stitch so you can get as close to the edge as possible to make a neat closure with no stitching showing on the outside of the project. Teflon foot/ Walking foot These two for me count as one foot, as they are both designed to aid in moving sticky, slippery or bulky fabrics through your machine. The Teflon foot is recommended for fabrics like PVC and leatherette where the surface has a tendency to stick to the underside of a metal foot. The walking foot can also help with this issue, but it can also be used for sewing bulky fabrics and slippery fabrics like Minky fleece which tend to shift when sewing with a regular foot. In the photo above you can see the results sewing on Minky fabric with the walking foot on the left and with a regular foot on the right. So much better with the walking foot I think you will agree. Blind Hem FootThe amazing invisible hem that you can achieve from this foot and its corresponding stitch is brilliant. Sometimes practice is required to truly appreciate what a wonder this foot can be, but once mastered it is a skill you won’t forget. Embroidery/darning foot If you have a need to be free with your stitching, an embroidery or darning foot will be your best friend. Once you lower the feed dogs (the little rough teeth that move the fabric through with your other feet) the bouncy foot will hold the fabric whilst the stitch is being made but will jump up so you can move the fabric in any direction you wish. Great for creating stitched art, appliqué and free motion quilting. Gathering foot. Again a rather specific use and a little temperamental but good fun if you are in the mood to play around a little. This foot will stitch and as the name suggests, gather your fabric as it goes. I find that it does better with light weight fabrics and small amounts, but it is a time saver when sewing long lengths of trimmings. Piping footYou can get different sizes of foot depending on the size of your piping, but basically the groove in the bottom is designed to hold the cord in place whilst you stitch the casing or cover in place. 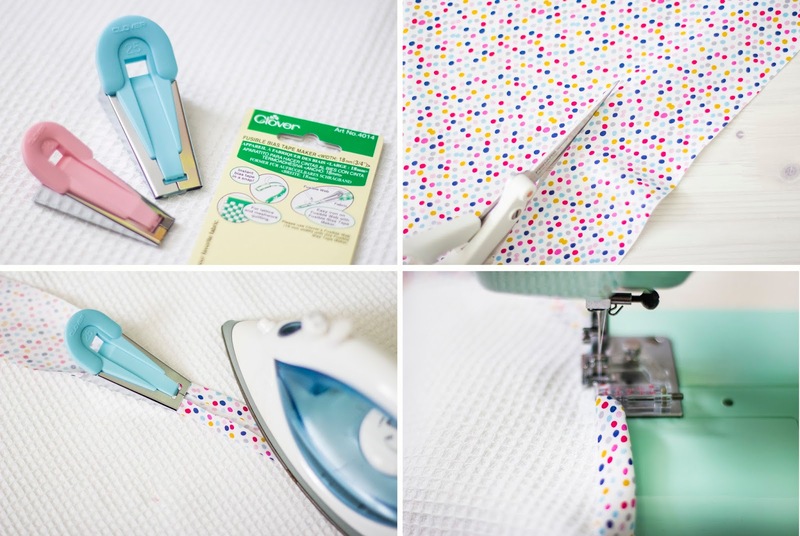 You can also use it when sewing the covered piping between two layers of fabric. Like the zip foot with zips, it is designed to get the stitch as close to the piping as it can, so as little of the stitching is visible on the finished product. Button hole foot/guide As the name suggests it is there as a guide when sewing a button hole by machine. It usually has markings on it so that it is easy to judge the size you need whilst sewing (if you have a manual button hole stitch). It also holds the fabric in place all the way around the button hole area whilst stitching to get a neat even finish. Bias binding foot Designed to make the dull task of sewing on bias binding a little easier. It holds the fold of the bias in place with consistency to get a straight line when sewing your binding on the straight or round a curve. You just wheel the guide in to place and sew! Roll Hemming Foot A simple and efficient way to get a narrow neat finishing edge is to use a roll hemmer. It is a little fiddly at first but once the technique has been mastered you will love it. Really good for finishing edges on silk scarves and fine or sheer fabrics. There are a couple of things I would suggest if you are thinking of trying or buying any of these feet for your own machine. Make sure you buy the right foot for your brand of machine. Keep all your feet and accessories together in one place and keep it in a safe, clean and dry environment. 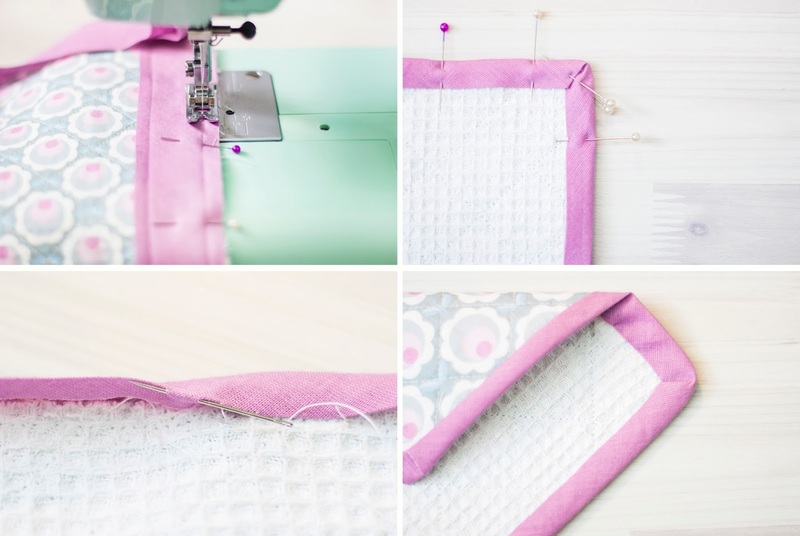 If you are using a foot for the first time, or for the first time in a while practice on some scrap fabric before you sew on your final project… just in case. Want to find out more about other sewing machine feet and more on how to use any of the feet specifically? You can head over to our friends at the Sewing Directory, where they have more articles about all the feet I have mentioned and more. Do you have a tool or technique that you love? 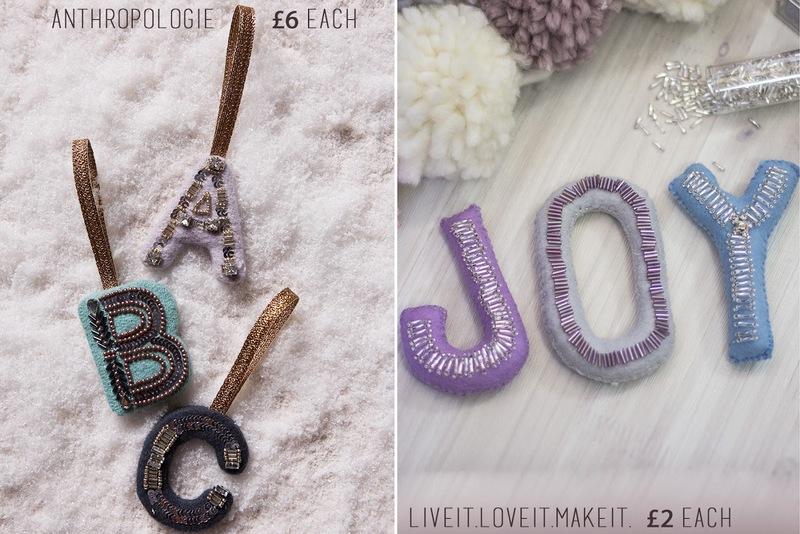 Is there something about sewing or crafts you have always wanted to know about? Let us know, we would love to write some more posts like this. 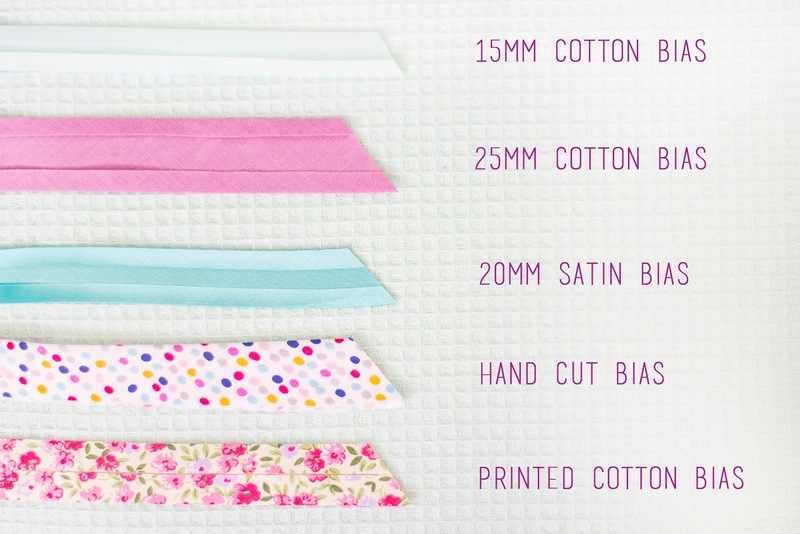 Look out for my much requested ‘Bias Binding’ Top Tips special in a previous blog! 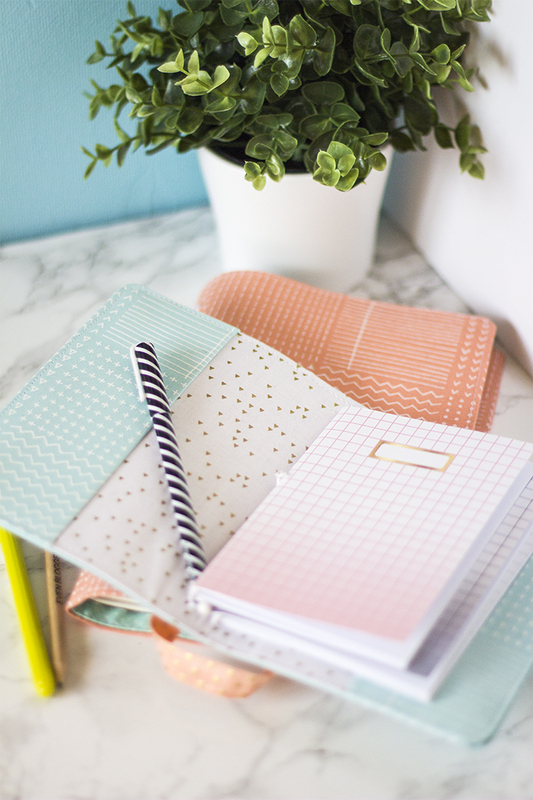 We are back with a fresh DIY for the new season; I am fast becoming a planner addict, but I needed to kerb my spending and find a way to use up some of my already huge stationery stash. When I got a travel planner as a gift a few months ago, I realised I could use up all those piles of thin notebooks if I made myself some of my own Midori style planners. So today I am going to share how I made two of my favourite’s. You will need – Medium weight card, a pencil, ruler, scissors, glue, two fabrics of your choice (approx a fat quarter of each), sewing clips, round elastic and decorative elastic, a hole punch, thread and a sewing machine. Step 1. Start by taking your notebook and placing it onto your cardboard and measure 2cm all the way around the edges, then flip it over to mark up the other side. Cut out that piece. Step 2. Mark up the centre lines and cut a second piece the same size as the first. Step 3. Curve off the corners either using a punch or just with scissors. Step 4. If you want to add some storage flaps, use the main pieces to draw out some strips and cut them out. Step 5. You should now have an inside, outside and any storage flaps you want, cut in card. Step 6. Place your card pieces down onto your fabrics and with a 2.5cm/1 inch border cut out your fabric. Do the same for the inside pieces and any storage flaps you have cut as well. Step 7. Take each of your card pieces and their matching fabric pieces and glue all the way around then fold over your fabric and stick it down. Step 8. Take care to fold over the corners over the rounded edges. Step 9. Sew along the straight edge of any flaps you have. Step 10. Sandwich your inner layer, flaps and outer layer together, then clip everything in place. If you don’t have sewing clips you can use paper clips or pinch clips. Step 11. Sew all the way around the outside edge of all your layers, try and keep about 3-5mm from the edge for a nice neat finish. Step 12. Punch two holes at the top and bottom of your folder. Try and place them either side of the centre fold. then punch one hole in the centre on the fold. Step 13. 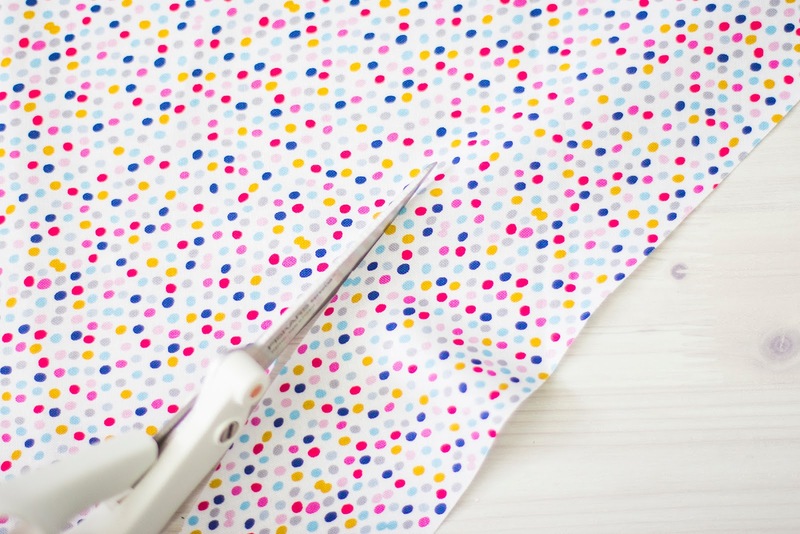 Take some small scissors and neaten up the holes you have punched. Step 14. Thread the round elastic through one of the double holes from the inside out and back through the other hole twice before tieing a flat knot and trimming away any excess. Step 15. 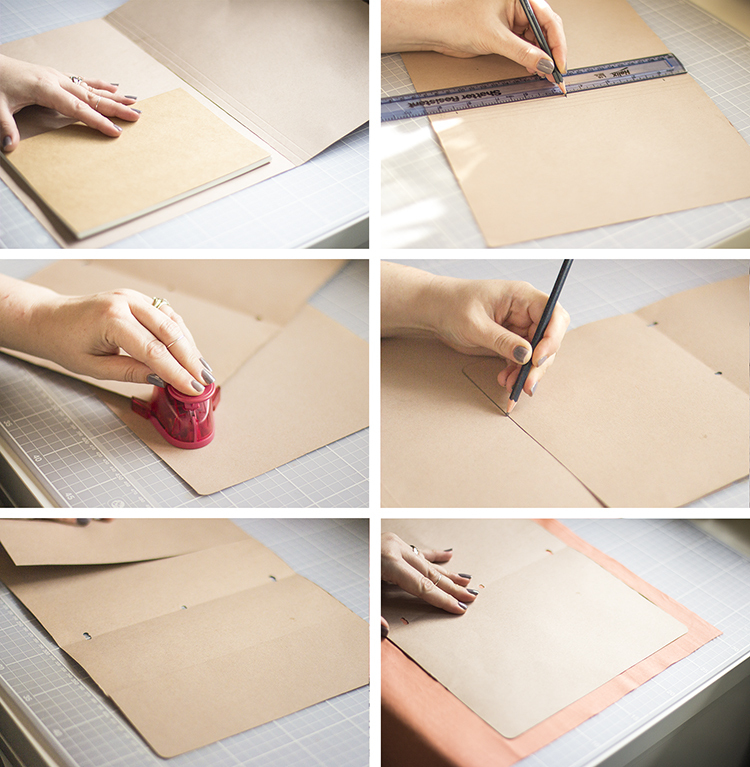 Take your pretty elastic and roughly measure it around the width of your folder. Step 16. 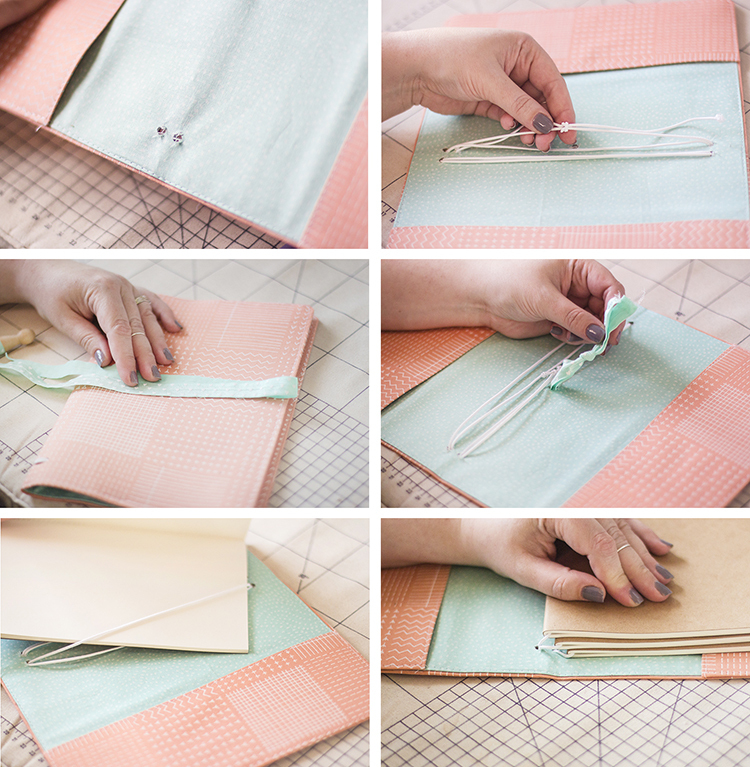 Thread the ends of your pretty elastic through from the outside and tie a knot to hold it in place on the inside of the folder. Step 17. 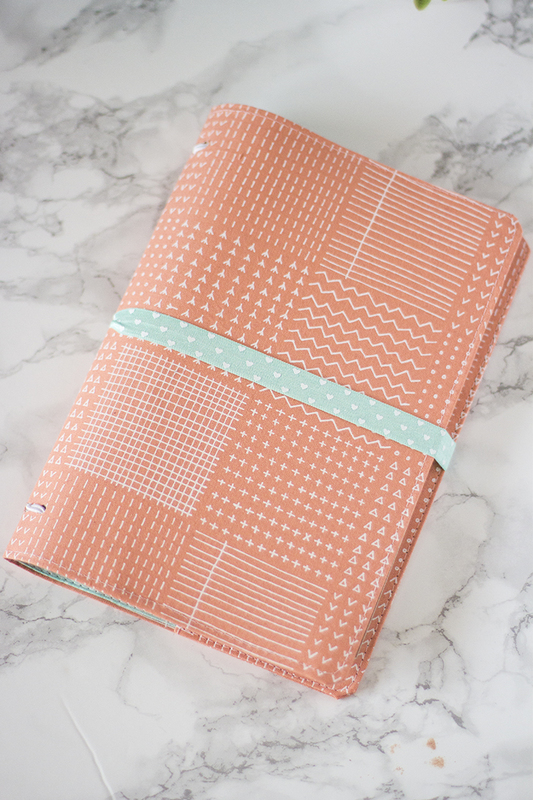 Open out your notebooks to the centre pages and thread it onto the elastic. Step 18. 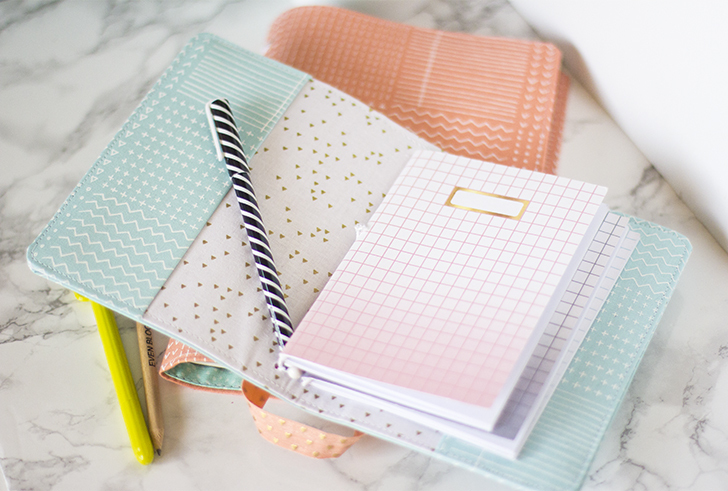 You can continue to add notebooks to fill out your planner or just stick to two or three. I have made an A5 and A6 version so far and I am in love with them. I have plans to make a few more for Christmas presents for all my planner friends. 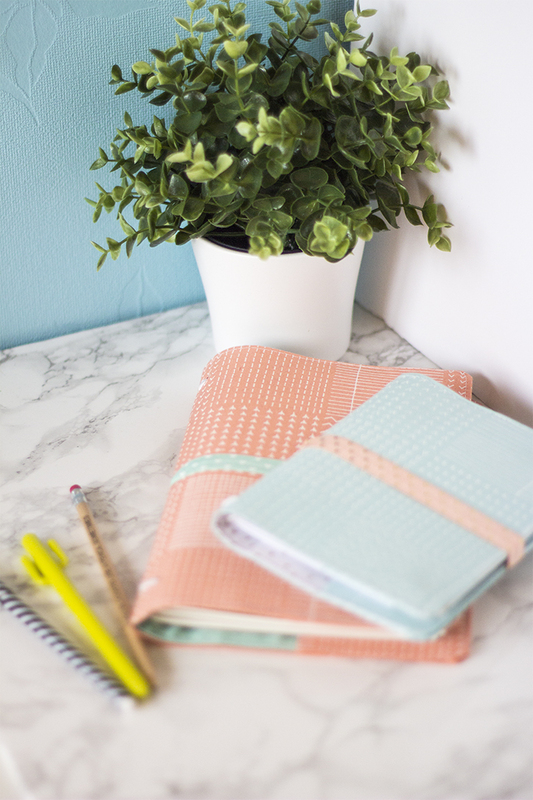 The fabric combinations are endless, they look really cute on my desk and who doesn’t love new stationery!! I get asked a lot at Sew Crafty what to look for when you are buying a new sewing machine, lots of our customers are intimidated by the sheer number of different kinds out there and where to even start looking. Here are my top ten tips for buying a new Sewing Machine. 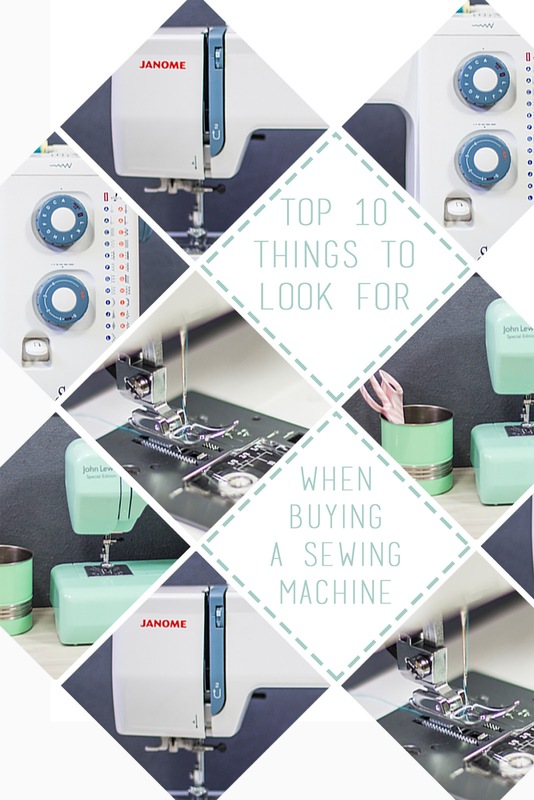 Before you dive straight in, why not try and borrow a friend or relative’s machine for a while and see how much you really use it and what kind of things you like sewing. It will give you a better idea of what you like and don’t like so you can make sure the machine you choose has those features. Be careful of picking a machine with too many bells and whistles. If it is your first machine you may be overwhelmed with too many stitch variations To start with keep it simple, you can always sell on your old machine and upgrade if you feel you are missing out. Always buy from a reputable source. I would always recommend buying from a bricks and mortar shop. If your machine is faulty or needs a service (it will eventually need one) you want a place you can go back to. It is not always possible of course so if you are buying online, head to a reputable company like John Lewis, and if you can, pay on your credit card so the purchase is insured. The added joy of finding a shop that sells Sewing machines locally to you is that you can go and try them out. You can ask questions of the shop owners, they should have good experience and if you have your list of requirements and budget they can hopefully match you to your perfect machine. Head to online guides like Which best buys or search online for reviews and recommendations for the machine make and model you are looking for. Buy the best you can afford, like I always say in haberdashery you get what you pay for and in most cases this rings true with sewing machines too. Try and choose a brand with parts that are easy to find locally or again from a reputable online source. It can be so annoying when you want or need to buy a new foot and you can’t find where to get it from. When you purchase your machine, find out where you can get it serviced. If you are buying locally you can often take it back to the shop for servicing, but if not you may need to contact an independent engineer. Your machine will need a service every year -18 months after the end of the guarantee to keep it running efficiently. Regular servicing will help to avoid larger repair bills and replacement costs further down the line. Your machine will need to be cared for. It will need cleaning and maintenance to help it run smoothly. Your machine manual will have information about how to dust and oil your machine to get the best results. It should be stored somewhere warm and dry. If it has been stored in the cold make sure you run it for a while to warm it before you start sewing. Ask to see the instruction booklet. It will be your best friend when late night sewing. Your local machine shop owner will not appreciate late night phone calls to chat about tension, but your machine book, if it is a good one, will answer a lot of questions. It should also explain all the accessories and extras that you can get and how to use them. We know we are not alone in our hoarding tendencies; we all have a stack of clothes that we can’t bear to part with, but know we will never wear again; for me it is a bunch of fun logo t-shirts I used to wear when I worked in my local pub. I had a uniform of black combats, turquoise hair extensions and cute t-shirts, don’t judge me it was like 2002! I didn’t keep all of them but I have kept a hold of my favourites, the ones that carry the best memories. They have been in a box in the loft for ages so when we were approached by the lovely people at Recycle Devon about an up-cycling post I knew exactly what I wanted to do. This t-shirt quilt gives you the opportunity to make use of those old clothes whilst keeping a hold of the memories, which is a winning combination for me! Step 1. Use the t-shirt with the largest logo and cut a square around it. Step 2. Use that as a template to cut the other t-shirts to the same size. Step 3. Once you have cut all the t-shirts to size lay them out on the floor and arrange them in a display that you like, balancing the colours and logos until you are happy with it. Step 4. Take a photo on your phone to remind you how you laid it out then place the top left and top center t-shirts right sides together. Step 5. Pin down the edge of the two squares. Step 6. Sew with a slight zig zag stitch along the edge you have pinned about 1cm in from the raw edge. Step 8. Then iron the seam flat then join the next square to the two you have already sewn together. Step 9. Move on to the next row joining the first two squares then the third square in to strips. Once you have all your strips ready you can place them right sides together matching up the seams. Step 10. Pin the strips together and sew all the way along the edge. Then unfold and pin the next strip in place and sew. Step 11. Unfold and you should have the front of your quilt. Step 12. 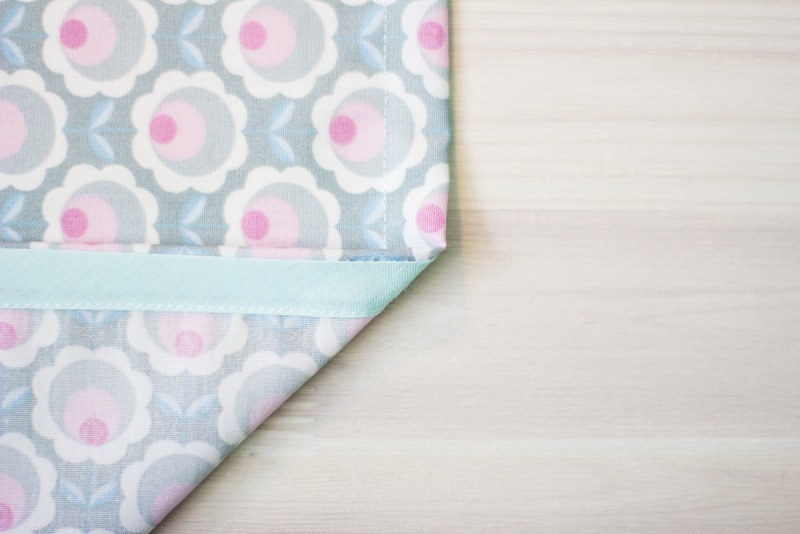 With right sides facing pin the front of your quilt to the throw or your backing fabric of choice then pin and sew around all four edges, leaving a small gap in one edge so you can turn it through. Step 13. Trim away any excess seams and the corners to make the edges less bulky then turn it right side out by pulling it through the gap you left open in the edge. Step 14. Hand stitch the gap close with some neat hand sewing. Step 15. To stop the layers sliding around take a length of embroidery thread and at the corners of the squares stitch the thread through the fabric. Step 16. Tie the length of thread in a double knot and trim the ends to about a centimeter long. And there you have it, the perfect memento to snuggle under and read a good book. I am actually going to keep mine in my husband’s car to snuggle under on our road trips. We want to know what you have in your home that you can’t bear to part with. Give a thought as to how you could re-purpose it and make it in to something you can love all over again. Gifts for the little ones this time of year can be so hard, just another plastic toy so soon to be discarded seems such a waste of money. I always like to make something for my niece because although her parents aren’t really ‘handmade people’ I know that she will love it. This year I have made her an advent calendar but she will have that before Christmas so to open on the day I wanted to give her a little handmade friend that she could play with. 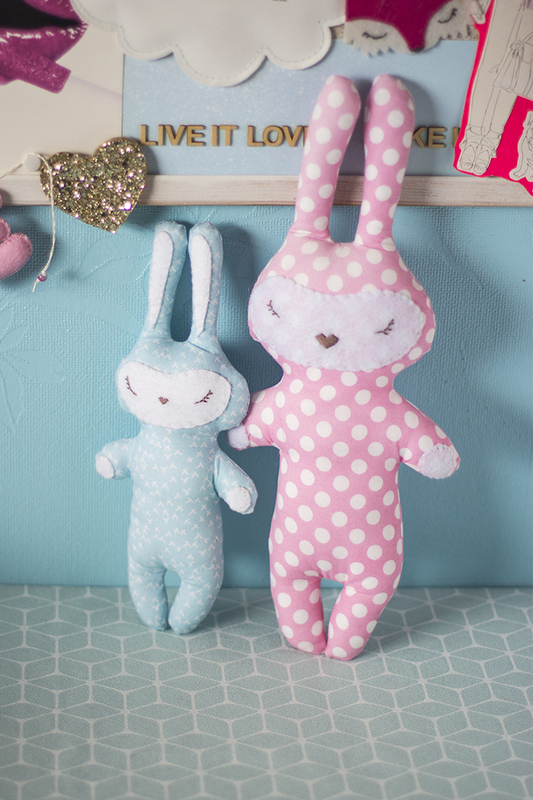 This little bunny toy is so simple to put together but makes a gorgeous gift for the little ones. Also, being made from cotton fabric there are literally thousands of options for colours and prints to choose from. 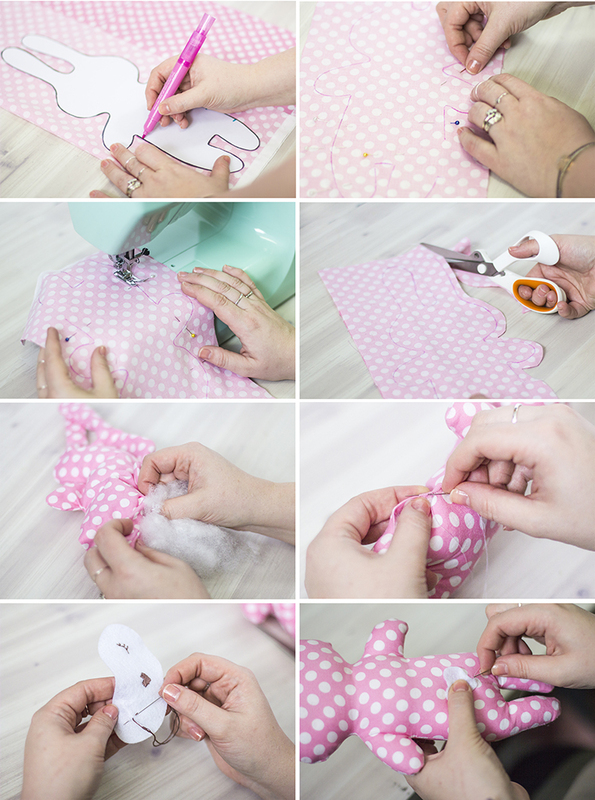 You will need: Bunny Template, 2 pieces of cotton fabric 25cm x 30cm, a felt square, thread, scissors, toy stuffing, embroidery thread, pen and needles. Step 1. Download the template, print it off and cut it out. With your two pieces of fabric, right sides facing, draw around the edges of the template with a fabric marker.Step 2. Take away the template and pin the layers together. Step 3. Take it to your sewing machine and sew around, following the line that you drew leaving a small gap along one side of the bunny body. Step 4. Cut around the bunny shape about 5-7mm from the line you have stitched. Cut small slits in the edges around all the curves. Step 5. Turn the whole thing right-side out and stuff with loose toy stuffing, making sure to push the stuffing right to the tips of the ears and right down into the arms and feet. Step 6. 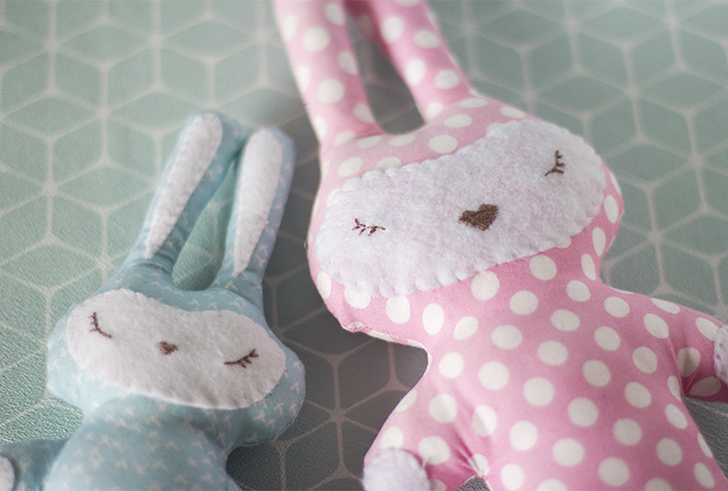 Once your bunny is all stuffed, hand stitch the gap closed. Step 7. Cut a kidney bean shape just smaller than the head out of white felt to make the face and hand. Embroider some eyes and a nose shape. 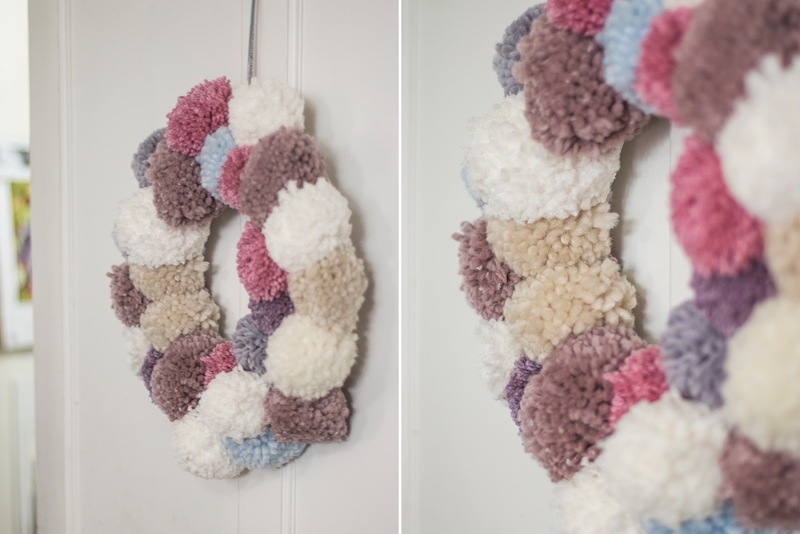 Also, cut a small circle or heart out of white felt to make a tail. Step 8. 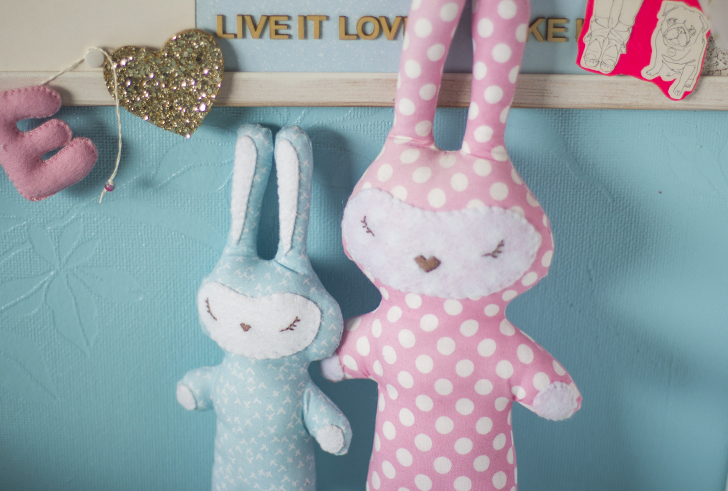 Finish off by hand stitching the felt pieces in place on your bunny. And there she is, a super cute, easy toy with bundles of character! 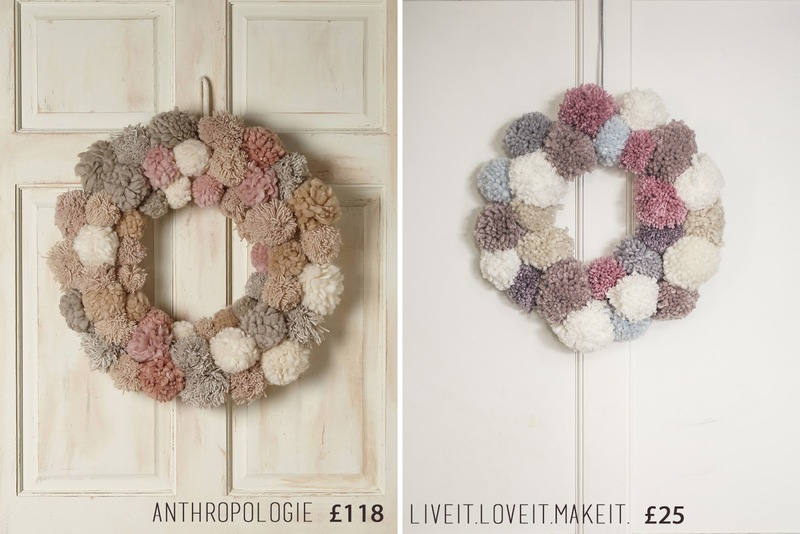 Just imagine if you made this out of an old favourite piece of the recipients clothing? Or beloved bedding that has seen better days? It would make it even more special. 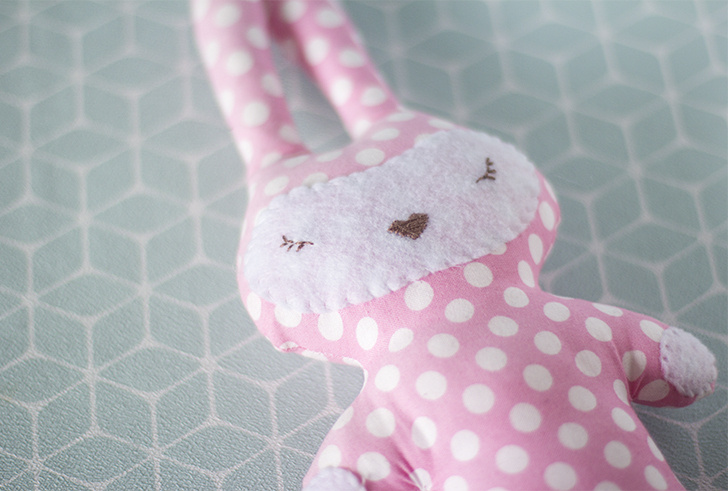 I reduced down the template to make a little friend for my big bunny to give to a friend of mine who is having a baby soon too, he is just as cute right! 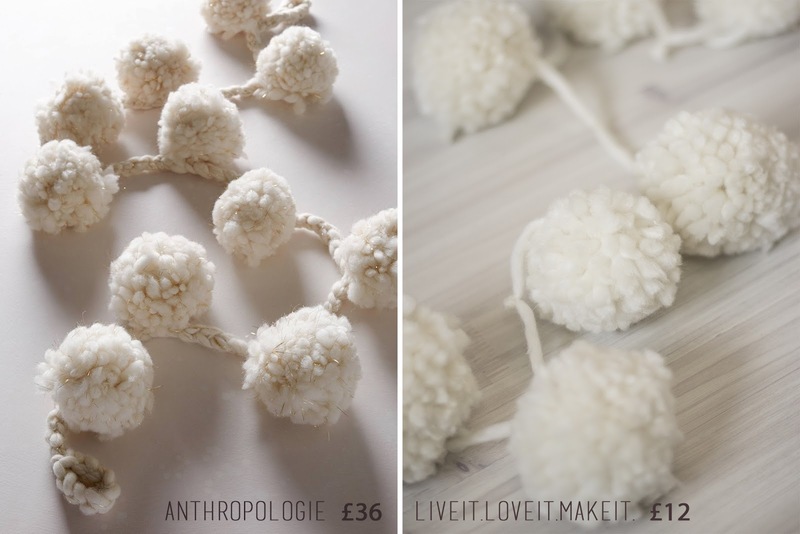 We always love to see the things you have made from our tutorials, don’t forget to share them with us by tagging #livelovemake on social media. 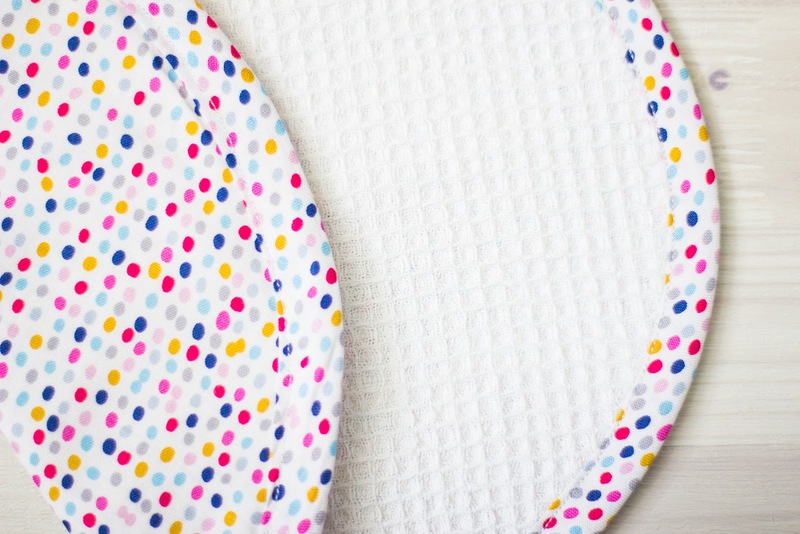 At Sew Crafty I get asked a lot about bias binding, like how to use it and what it’s for, which is understandable, if you have never been taught about it, it may seem like a bit of a mystery. I love how it can take a project from okay through to polished and it really isn’t as complicated as it may appear. So I thought for this month’s sewing tips post I would write a definitive post including everything you ever wanted to know about Bias Binding. What is Bias Binding or Bias Tape?Bias Binding is a strip of fabric cut at a 45 degree angle to the straight weave of a fabric. It is cut this way to take advantage of the ability to curve around corners when fabric is cut on the cross. What do you use it for?Often it is used to edge quilts and bags, it can be used as a narrow facing, particularly around arm holes in clothing. You can use it to cover piping cord to make an edging or you can sew it together to make a rouleaux style tape to use as ties or cord. What different kinds are there?At Sew Crafty we stock cotton bias, polyester satin bias and printed bias. You can also make your own out of pretty much any fabric and you can also get stretch or Lycra bias, although I prefer to cut my own if I’m sewing with Jersey from the same fabric if needed. I usually buy an extra half a metre of any stretch fabric I buy to allow me to cut bias. How do I make my own?To make your own bias tape you simply need to cut strips across your chosen fabric at a 45 degree angle to the straight weave of the fabric. You can then with or without a bias binding maker, fold the edges in and iron it to set the edges in place. 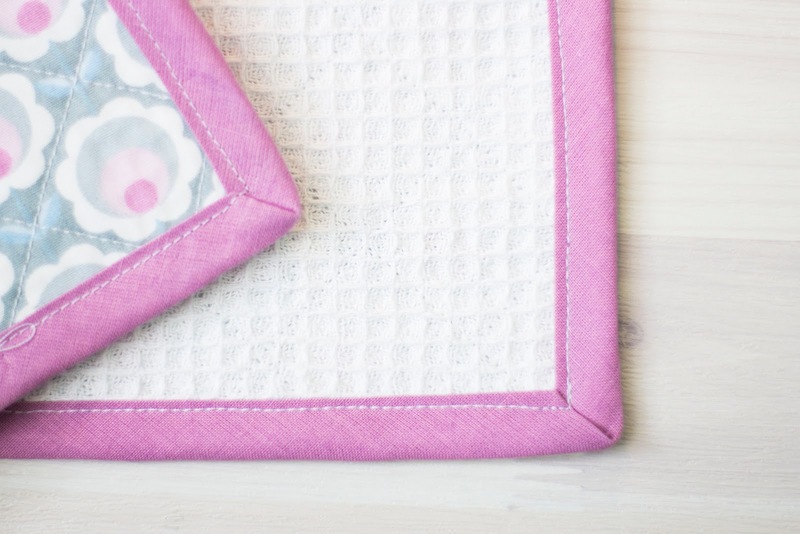 If you are going to be using it as single fold it is easier to do this before you start to sew it in place, if you are using it as double fold, you wont need to do that step. What is the difference between single fold and double fold bias? 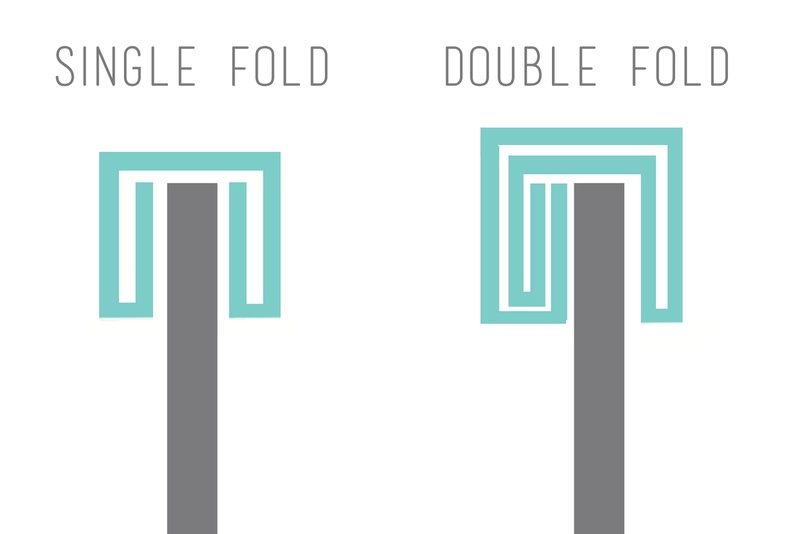 When talking about single fold and double fold some people get confused, the bias you traditionally see with the two raw edges folded in, is actually single fold and bias tape with the raw edges unfolded is double fold bias. 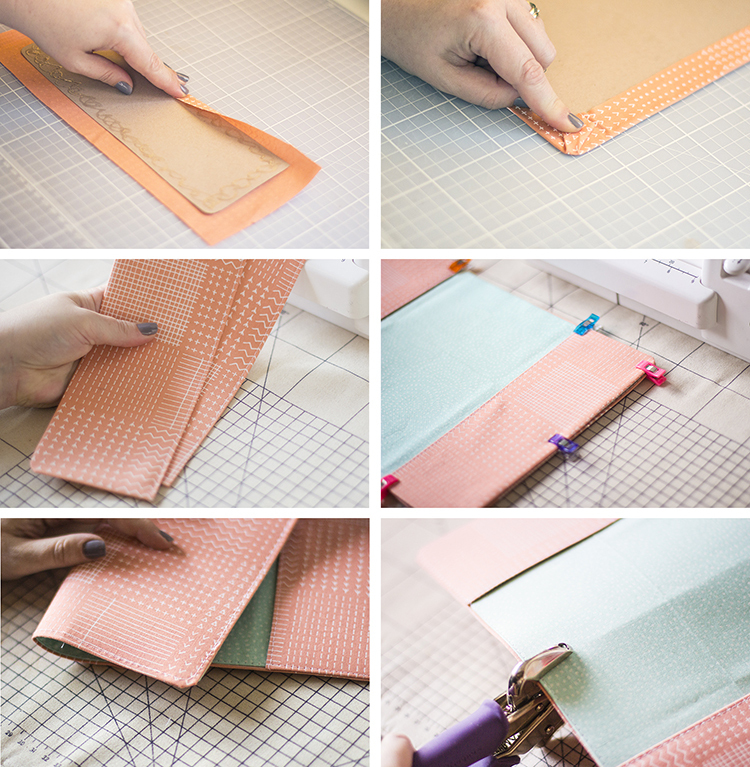 Single fold is attached by unfolding the pre-folded edges and sewing the raw edge to the raw edge of your project with right sides together using the fold as a sewing guide. It is then folded over and the other raw edge folded under and hand catch stitched in place so that none of the stitching shows. Double fold is usually much wider, usually hand cut. You sew the two raw edges to the raw edge of your project and then fold the whole thing over to the other side before catching it down by hand. It is designed to give an easier finish as you are catching down a fold and not having to fold under a raw edge as you go like single fold. However it does make the finish a little bulkier as you are using a double layer of fabric. Are there any special tools you need to sew it?You may remember I mentioned in my Top 10 Sewing Machine Feet post about this little wonder that is a bias binding foot. 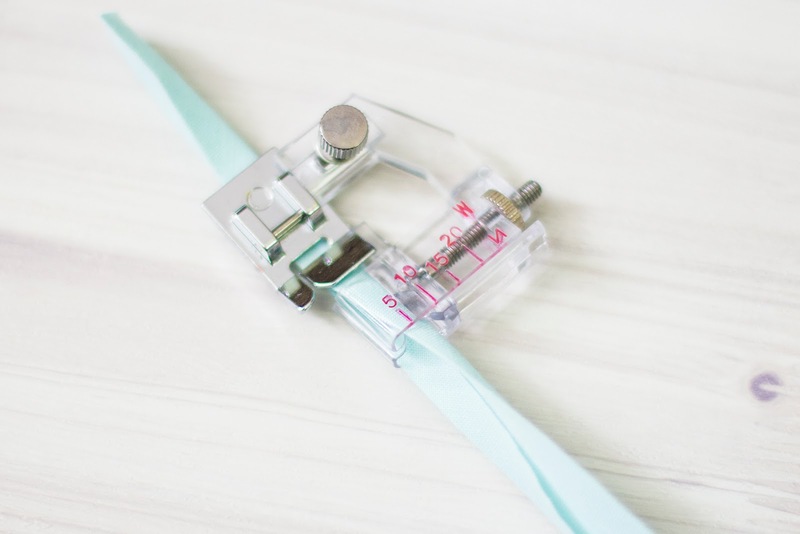 This little guy takes all the faff out of sewing bias tape in place as it holds the bias in the attachment as you sew it, so basically it feeds the bias through sewing it perfectly in place every time. Some people don’t like it because you can see the stitching but it makes big jobs so much easier. As I explained above it is not necessary to buy one, you can just sew bias with a regular sewing machine foot, or by hand. It curves! ?The best advantage of bias binding being bias cut is that it will nicely curve around corners, this is great for edging around things obviously, but it is also a great help when finishing off necklines and armholes on clothing. It is also great if you struggle with hemming flared skirts as it will curve with the hem and give a smooth wrinkle free hemline. How would you use it as a facing? If you don’t want to line a piece of clothing but you want a nice neat finished edge you can use bias binding to help you get a nice professional finish. 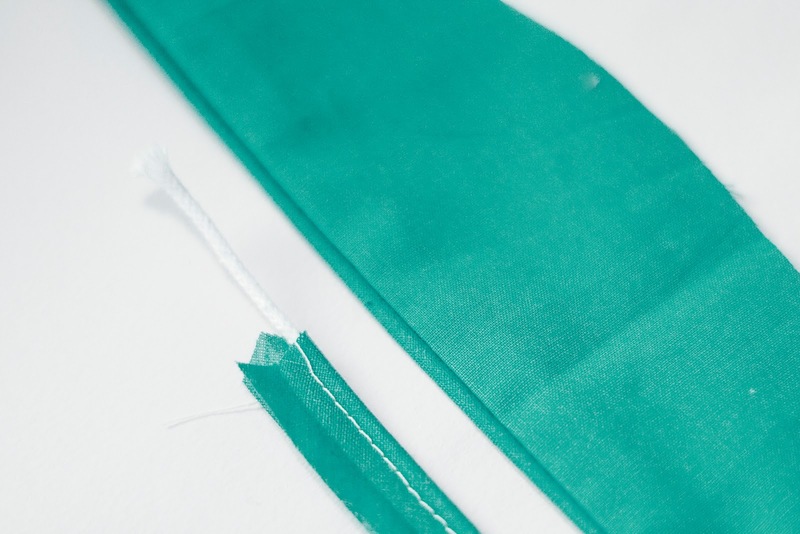 By sewing the bias as you would normally, but folding the entire tape to the inside of the garment and sewing it with a line of top stitching you get the benefit of a crisp finish without the bulk of a lining. What else can it be used for?Bias tape is also great for covering piping cord, again because it is so great at going around curves it sits beautifully when wrapped around cotton cord or simply sewn into the seams for cushions and detailing on clothing. Wow! That is a lot to take in, sorry, I wanted to be thorough. I hope that has answered everything you ever wanted to know about our flexible friend. If you have a question that isn’t answered in this post, let me know in the comments below and I will do my best to answer it for you. An explosion of colour is bursting out of this weeks first Sew Crafty Fabric drop, its Fantasy Florals, and I tell you what these are my fantasy! They are all semi-sheer, multicoloured and with textures to die for. First up is an amazing Airtex fabric that has been digitally printed with a colourful floral design, I love the idea of using this for some fun sportswear, along the lines of the Stella McCartney Adidas collab a few years ago, it would also work wonderfully for beach coverups over swimwear. One of the first fabrics I ever bought for the shop back when I was 21 was almost identical to this, I loved it then and I love it now. A soft stretch mesh with lilac flowers and green foliage, it would make stunning kimonos or used like lace as a decorative layer over a block colour but used shear as sleeves on a dress. This magical fabric is ivory lace covered in sequins then it has been digitally printed over the top, I mean, special is not even enough! Last but not least is another digital printed lace, somehow the areas of white space on this print make the colours pop even more. Again a gorgeous choice for sheer statement sleeves, or full skirts with a solid coloured lining. Head over to check out the Fantasy Florals Collection on my online store Sew Crafty. I upload new fabrics, notions and sewing essentials there every week.